These accessories are optional and they are designed to optimize the performance of your Litter Robot III. You know that this auto litter box works excellent in taking care of the scooping task but if you add some of these accessories this machine gets to perfection. Some of these items are complements to upgrade the litter box, such as the Ramp and Fence and others are optional supplies, such as liners and litter. You can get each accessory separately or if you prefer you can get the Accessories Kit. Personally, I wanted the Ramp, Fence and Carbon Filters and I figured it was cheaper buying the Litter Robot Accessories Kit than purchasing every item separately. I was happy to know that I saved $10 by buying the kit. You can get the Accessories Kit or buy the Ramp, Fence or any other accessory individually on this link. GOOD NEWS! There is a Smart Wi-Fi version of the Open Air now so you can fully control and monitor the litter box from your iPhone! The good news is that you can convert your existing unit into a Connect version! Check my Litter Robot Connect Review to learn how to convert your existing Open Air and learn all the new great features. You can also check this accessory at the bottom of this page. WHAT DO YOU GET BY PURCHASING THE ACCESSORIES KIT? I wanted the Ramp because my cat Sophie was creating a mess when jumping out the Litter Robot. Most cats enter the unit by stepping on the step without any problem, but exiting the litter box is a different story. The Ramp is lightweight but made from very solid plastic. It features rubber feet for stability when your kitty steps on it. The Ramp fits smoothly in the recessed mount of the step and the mat fits exactly right in the recessed mount of the Ramp as well, very well designed. This accessory is a good option if your cat jumps out of the litter box instead stepping on the step when exiting the unit. When cats jump out, they carry litter on their paws that gets spilled onto the floor, creating a mess. By placing this ramp all that litter attached to your cat’s paws goes to the ramp instead of onto the floor. 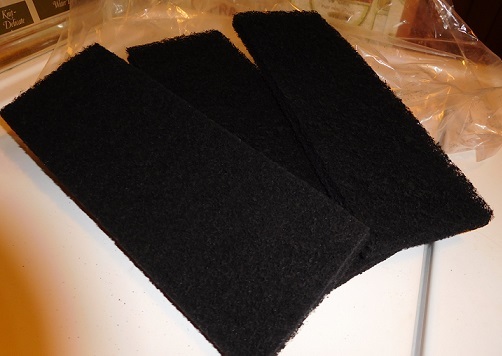 The rubber mat on the Ramp will help to remove that excess of litter from your cat’s paws and the ridge around the perimeter of the ramp contains the spilled litter. To clean it, jump grab the Ramp and tilt it to make the spilled litter to go to the corners and then dump it back to the Litter Robot. This Ramp is designed to fit on top of the step of the unit, using the existing black step mat. The installation of this accessory doesn’t need special tools. You only need to remove the black rubber mat of the step to uncover a recessed mount for the Ramp. Place the smaller end on the step and put the black step mat in the recess of the Ramp. 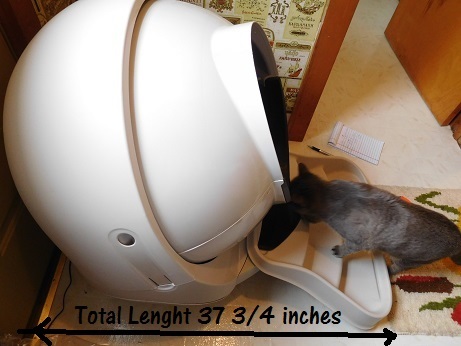 The total length of the Litter Robot with the Ramp installed is 37 3/4 inches. Consider this new length on the current area where you have your Litter Robot. When I installed the Ramp my cat was very hesitating to the point of not using the litter box. I figured I needed to encourage her to use the Ramp so I put treats on it. She immediately stand up on the Ramp to eat the treats and felt confident enough to use it. After she got used to stand up on the Ramp, she started using the Ramp without problem. On the following video Sophie is entering the unit stepping on the Ramp for the first time without me using treats. This addition is excellent to help elderly cats or cats with arthritis to have a smooth walk out of the litter box. And think about this ramp for your kitten too, the ramp helps small cats to exit out of the unit so they feel more confident to use the Litter Robot. 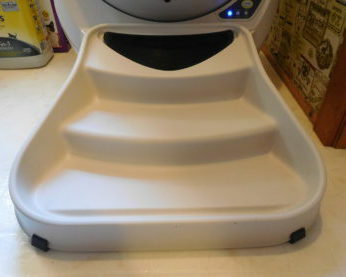 The Litter Robot ramp features non-slip rubber feet to keep the ramp in place which is very important for your cats confidence when walking on it. Simply lift the Ramp and set it aside. You don’t need to remove the mat at all. Open the waste drawer as usual and place the Ramp back on. WHAT ARE THE PROS AND CONS OF THE LR RAMP? I recommend the Litter Robot Ramp because it keeps the litter area much cleaner. My cat Sophie created a mess that I had to clean almost 2 times a day and now the litter area is cleaner and all that spilled litter goes into the Ramp. The fences has two purposes: to ensure your cat’s fully entry into the litter box, preventing your cat’s tail from hanging out of the box, avoiding “accidents” when doing its business. The other purpose is to serve as a barrier to block kicked litter from going onto the floor or Ramp. In my particular case, I needed the fence to stop some litter from coming out the Litter Robot, it was not so bad because my cat doesn’t dig too much but I figured I would try just to see the difference and there is a big difference on spilled litter, especially if you have a heavy digger. 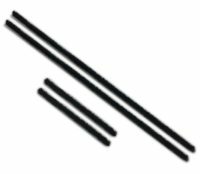 The fence adds 1.25 extra inches to the lip, making the lip higher which allows it to stop some litter from going outside. Additionally, it helps to discourage cats from pointing their butts towards that direction. The fence is made from hard plastic, really quality material and it’s not toxic. The Fence is easy to clean, you only need to remove it from the Globe and wash it with a mild detergent. WHAT ARE THE PROS AND CONS OF THE LR FENCE? 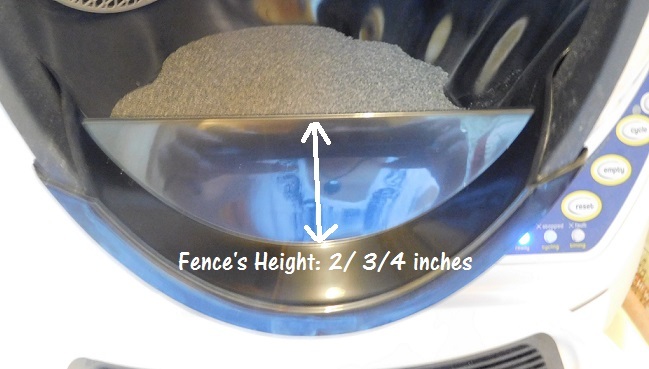 If your cat is a heavy digger and litter kicker or if your feline friend has frequent “accidents” on the entry way of the Litter Robot I recommend you to get the Fence. If your cat doesn’t dig too much and it doesn’t have the problems mentioned above the fence it’s not that necessary. 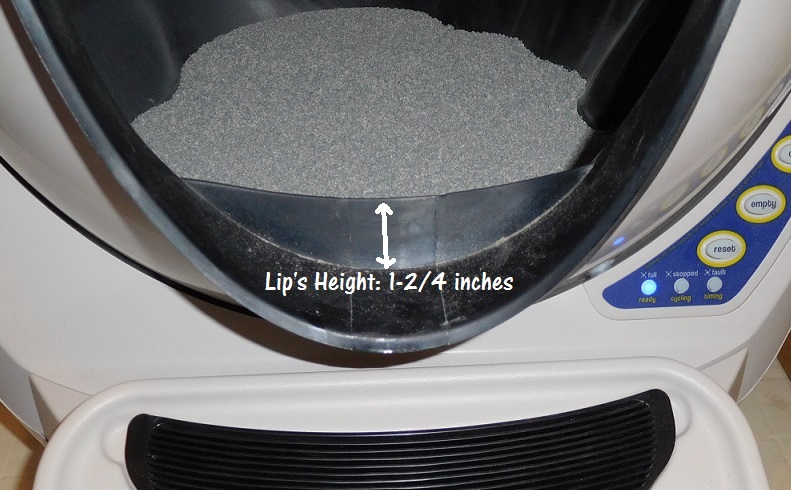 The carbon filter gets inserted on the vents of the waste drawer of the Litter Robot, absorbing odors. You can remove and replace the carbon filter when washing or emptying the waste drawer. The frequency of change of the filter depends on your cat’s use of the litter box and your preference. The manufacturer suggests to change the filter every 3 months, but with one cat and good odor control clumping litter the carbon can last for up to a year. In my case I went a full year with the filter that came with my Litter Robot and I just changed it. I must mention that the frequency of changing the carbon filter will depend on the food you feed your cat. Foods with by-products make cats to create more stinky feces so this will be an important factor when replacing them. I found that the carbon filters really help to eliminate odors from the waste drawer and they last a long time. It’s important to mention that the filter is optional and the machine doesn’t require it to operate. The pack includes 3 carbon filter pads. WHAT ARE THE PROS AND CONS OF THE CARBON FILTERS? I highly recommend using the carbon filter because it really eliminates the odors from the waste drawer. The waste drawer liners are a good alternative for those who are looking for ecologically friendly liners since these are biodegradable. 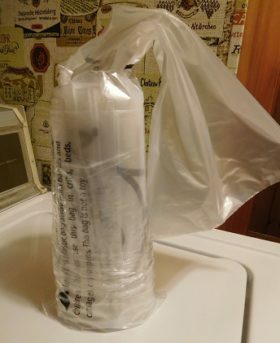 These liners fit perfectly in the waste drawer and they will help you to reduce plastic contamination into the environment so if you want to reduce plastic waste in our planet, these liners are your choice. These liners come in rolls of 25, 50 and 100 and they compatible with all Litter Robot versions. To give you an idea, a pack of 50 liners will last about one year with a single cat and 100 liners will last easily over a year with 2 cats. The dimensions of the liner is 23.5” x 29” and it has a usable capacity of 9-11 gallons. I recommend the liners if you are ecologically conscious and don’t mind to pay more for them than kitchen bags. This addition is very helpful if you live in an area with frequent power outages. 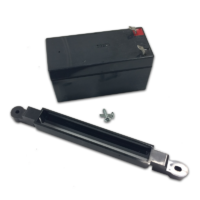 This battery allows the unit to work for up to 48 hours without electricity. I decided to get the battery backup because we have had a lot of rains and bad weather lately and I like to prevent problems before they come. 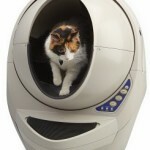 I wouldn’t like to have my cat alone at home without the Litter Robot being working. The duration of this backup battery depends on how often your cat uses the litter box and if you use it with two or more cats. On average, with 2 cats the battery provides approximately 10 cleaning cycles per day. With my cat Sophie, this new feature will provide up to 20 cleaning cycles which is excellent and gives me a peace of mind that my cat will have her favorite litter box always clean no matter what. Even though the battery backup is really easy to install, I was not comfortable doing it myself so I asked for help (but when I saw the installation, I’ve could done it myself with no problem). Step 1. The first thing you need to do is unplug the unit. Step 2. Remove the Bonet, the Globe and the waste drawer. In our case the serial number was above 933 so we had to connect the leads and terminals of same color. Step 4. Tilt back the Litter Robot base carefully and find the battery compartment. Remove the leads from the tapes. Step 5. Connect the leads and terminals and place the battery inside the compartment. Step 6. Put the battery bracket and screw it. You will need a small star bit screwdriver. Here we made a video for you to see how to install the battery backup but first I put a video how to remove the Globe in case you have never done it before. PROS AND CONS OF THE BATTERY BACKUP? I recommend the battery backup to ensure your machine will be working at all times no matter if your area experiences power outages. This is an extraordinary feature that you and your call will appreciate, especially if you need to go on a trip and leave your cat alone. You can get the battery backup here. The strips seal the waste drawer so no smell leaks out of the litter box. 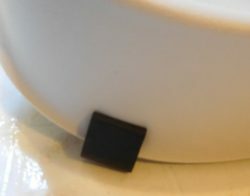 The seal strips can be replaced if you see them worn flat but you can extend their lifespan by trimming them. Special care when cleaning the base of the litter box because if the strips get wet they could peel up. To keep them working better you can vaccum them or use a lint roller to remove lint and hair. The seal strips are optional and the Litter Robot doesn’t require them to function, but they can become a life changer if your cat creates a really stinky waste. 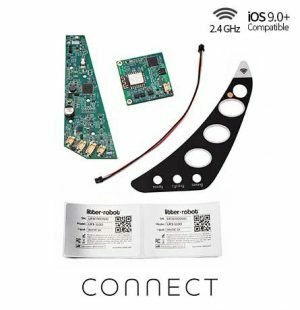 The Connect Package is a kit that allows you to upgrade your current Litter Robot 3 to make it a Smart Wi-Fi automatic litter box, working exactly like the Litter Robot Connect. Once you install this accessory properly you will be able to manage all the functions of the control panel from your Smartphone. Currently, the Connect is working with iPhone only but Android is coming soon. Now you have all the information you need to get the right accessory for your Litter Robot so your cat can enjoy an upgraded machine!